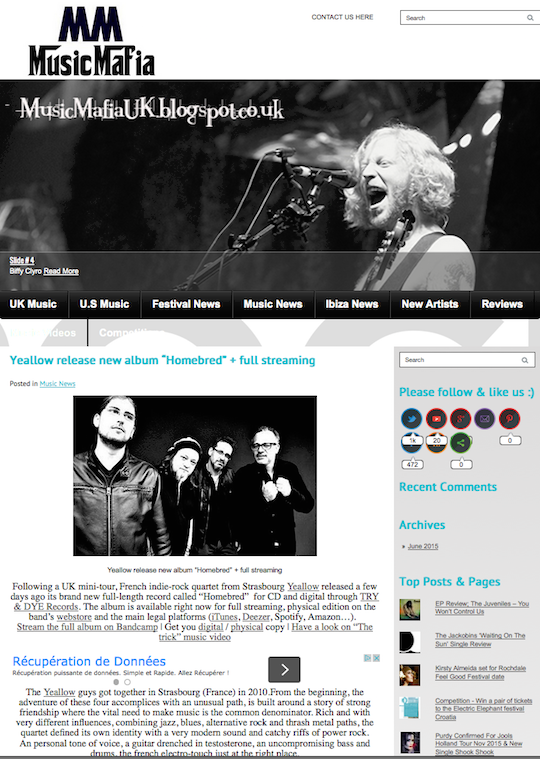 Following a UK mini-tour, French indie-rock quartet from Strasbourg Yeallow released a few days ago its brand new full-length record called “Homebred” for CD and digital through TRY & DYE Records. The album is available right now for full streaming, physical edition on the band’s webstore and the main legal platforms (iTunes, Deezer, Spotify, Amazon…). The Yeallow guys got together in Strasbourg (France) in 2010.From the beginning, the adventure of these four accomplices with an unusual path, is built around a story of strong friendship where the vital need to make music is the common denominator. Rich and with very different influences, combining jazz, blues, alternative rock and thrash metal paths, the quartet defined its own identity with a very modern sound and catchy riffs of power rock. An personal tone of voice, a guitar drenched in testosterone, an uncompromising bass and drums, the french electro-touch just at the right place. Their shows propel an hi-energy and explosive cocktail. Immediately spotted by a promoter in the U.S. after the release of their first album – “2891 seconds” – (2010), the group embarked on a tour in the legendary clubs of Los Angeles and San Francisco (Whisky a go-go, Cat Club,…). In France, they played in all major regional theaters (La Laiterie, Noumatrouff, etc …) then make a stop at the Bus Palladium Paris before leaving for a UK tour in 2012 (Camden Rock, O2 Academy Tower, The Cavern Club, …). Late 2013, Yeallow started to compose again. They came back in 2014 with a new digital single – Clocks – and one year later with their second album : “Homebred”.